[map] [street view] Between Memorial Parkway SW and Robinwood Drive SW, just south and off of Hollywood Boulevard NW. Co-located with WPSM, WHWY and WTKE. [Picture] Image with RDS data from an Insignia HD portable showing the PI (call sign) and Radio Text fields. This station dates back to 1981 when it was first granted a construction permit for a new station in Evergreen, Alabama, along I-65 to Vogel Moody Corporation. The permit was later assigned to Stafford Broadcasting, who owned the only other station in Evergreen, AM 1470 (then WEGN). Before the station was put on in October 1982, the calls assigned were WTII. When the station signed on it was WEGN-FM. More than likely the station carried a simulcast of the country music format of the AM for the first part of its life. In the mid-80's the stations went through several subsequent ownership changes, winding up in the hands of Wolf Broadcasting by the start of 1987. A year later they changed the calls to WIJK-FM and began programming the FM separately, although there seems to be no record of what the format was during this time. In 1992 the calls changed to WPGG-FM and the station became known as "The Power Pig" with a country music format. The station most likely started off with 50 kW from a transmitter site in Evergreen itself, but by 1996 they'd won a construction permit to bump up to a full 100 kW. In 2001 a construction permit was issued to move to a site about halfway between Brewton and Andalusia, to better compete in the lucrative Florida panhandle markets of Fort Walton Beach and Pensacola. That permit was never built out; instead, a permit was secured to move the station right to the coast, licensed to the Fort Walton Beach-area community of Shalimar, with 50 kW. Before that facility was built out, Star Broadcasting (Ron Hale) sold the permit to Cumulus for cash as well as ownership of FM 100.3 and AM 1400 in Fort Walton Beach. 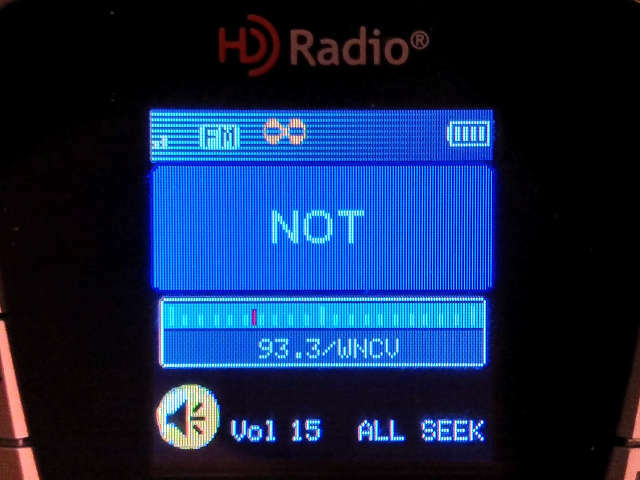 After the sale, this station had the WRKN calls for less than a month; afterwards the adult contemporary format and calls from 100.3 moved here, and this became adult contemporary "Coast 93.3" with the WNCV calls. The Power Pig format moved to a different FM station in the Evergreen area.